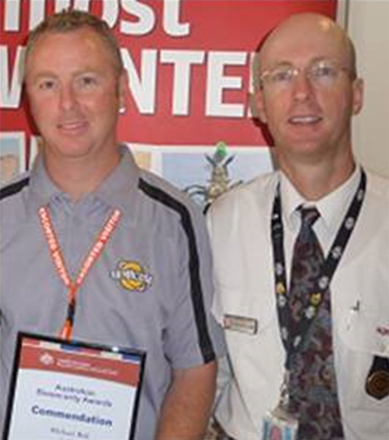 Pest control business Southpest scoops top quarantine award. AQIS today announced the regional winners of its annual Biosecurity Awards at a ceremony at Crewe Place in Rosebery. The Biosecurity Awards recognise organisations or individuals that have made an outstanding contribution to maintaining Australia’s biosecurity integrity. AQIS Regional Manager Rick Hawe said the excellent work done by Michael Bell, Managing Director of a Southern Sydney based company Southpest, highlights the partnerships needed to safeguard Australia from the risk of entry of exotic pests and disease. AQIS officers cannot be everywhere all the time and that is why a shared commitment to biosecurity is so important,” said Mr Hawe. Pestcontroller Michael Bell (pictured with AQIS Entomologist Ross Rickard) was called out to eradicate an insect infestation in his customer’s home. Mr Bell noticed the problem wasn’t his customer’s home, but rather suspicious beetles in her recently purchased lounges. He sent an insect sample to AQIS officers, and they were identified as the Lesser Auger Beetle, a serious pest, exotic to Australia and a threat to a range of wood products. Mr Bell’s referral and actions assisted AQIS in dealing with this threat and treating the biosecurity concern in a timely manner. “Southpest are delighted to receive the prestigious AQIS regional biosecurity Certificate of Commendation in recognition of our dedication to caring for the environment,” Mr Bell said. “We commend Mr Bell for his quick action and co-operative working relationship with AQIS and the community,” Mr Hawe said. “Individuals, companies and AQIS must continue to work together to ensure threats to Australia’s biosecurity are minimised and managed effectively. The awards today recognise this,” Mr Hawe said.